Bombs Away: AC, Fleas, & Toddler?! So the last few days have been pretty eventful. Just to back track, I neglected to mention that upon returning home from our vacation a few weeks ago, we discovered that our upstairs AC had gone out. Great welcome home, I know. And long story short, and about $1,000 later, it works again. However, now that we’ve been topping triple digits here lately, of course the downstairs AC had to also go out a couple of days ago. And this time, the repairs don’t make sense to make ($$$$$). Thus, I spent the day getting several different quotes for a new unit and I have learned way more than I have ever, ever, EVER wanted to know about AC’s. It’s after 10pm and I’d like to note that the master bedroom temperature is currently 87 deg F and somehow still seemingly rising (?). My mom happens to be visiting so our upstairs guest room is occupied, and knowing my un-chivalrous hubby (sorry, it’s true! ), so is the couch upstairs, haha! Looks like I will be sleeping with the fan 5 inches from my face tonight. AGAIN. I’d easily argue that between our recently purchased Tempur-Pedic mattress (we love it!) and our AC repairs and new unit, we’ve done our part to stimulate the American economy! Also, on a sad note, our dog Smoke somehow got into a very serious nest of fleas. And when I say nest of fleas, I really mean an apocalyptic proportion of fleas. Scott treated him AND the yard, but I’m afraid we might need to bomb the inside of our house too. What a pain and poor Smoke Rider! On a much happier note, Landri is literally on the verge of walking. 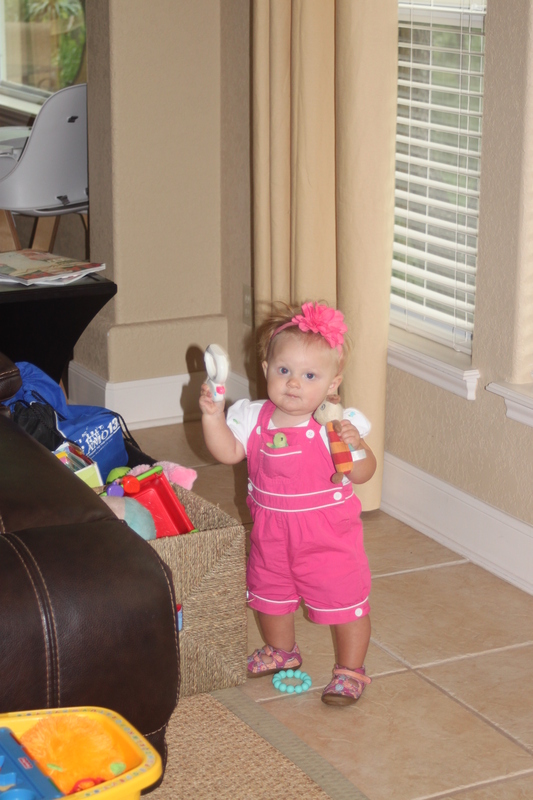 In fact, she’s been standing a lot lately and today has been taking very small baby steps unassisted every now and then. Here’s a short 4 second clip of her newest feat. Please excuse my piercing scream as she does an awesome face plant (or turn your volume down)! I’m guessing she’ll be on the go within a week or two for certain! Also, and just for fun, here’s a picture of her standing! Next Post 11 months: Sharp Teeth, Fire Breath, Naughty Landri & More!